You could easily make this when you come home from work. 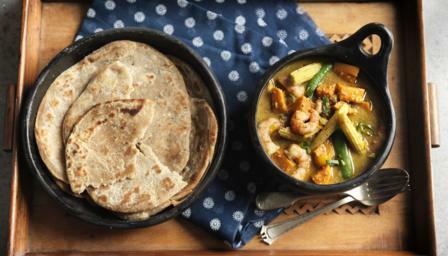 The curry is extremely tangy, full of flavour and pretty filling, while the chilli and black pepper roti bread are kind of like naan bread - quick to make and great for dipping. Add the sugar snaps and baby corn and cook for 4-6 minutes, or until tender, stirring occasionally. Mix in the prawns and cook for two minutes, or until they turn from grey to pink. Remove from the heat, throw in the spring onions, squeeze in the lime juice and season to taste.